How to sell home fast for more cash! 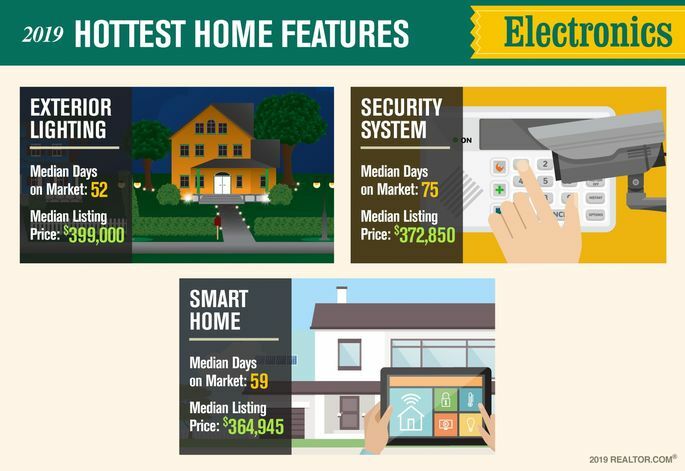 To figure out the top home features, we dug through more than a million single-family home listings on realtor.com in February. 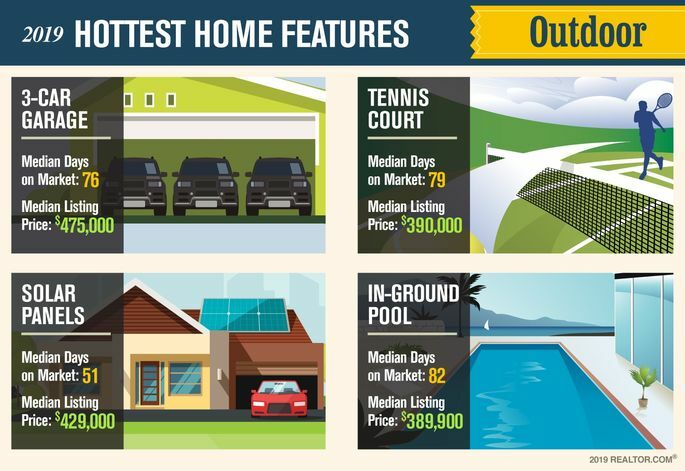 We calculated a median price and days on market for each abode with one or more of the 70 popular features we evaluated for this ranking. Features in homes that took longer than 84 days to sell, the national median, were cut from our list. We also eliminated amenities, such as high ceilings, that are difficult—and expensive—remodels. OK, let’s take a closer look at trends that could help you make bank when it comes time to cash in and sell your home. Once upon a time (say, when you were growing up), most kitchens were drab, unsexy spaces that folks didn’t spend much time in beyond preparing and consuming dinner. But as the open kitchen trend has exploded, they’ve become centerpieces of the home—way more visible, personalized, luxurious, and important to buyers. Homeowners have upgraded to chef’s and gourmet kitchens (No. 1 on our list), making them glamorous showpieces where they can entertain their friends. These days, trendsetters are choosing dark and moody color palettes, like black and navy, over the more bland white, gray, and neutral shades. They’re opening the rooms to the outdoors by installing walls of windows or double doors that open to the yard. And open shelving (versus the classic kitchen cabinets) is gaining more traction. 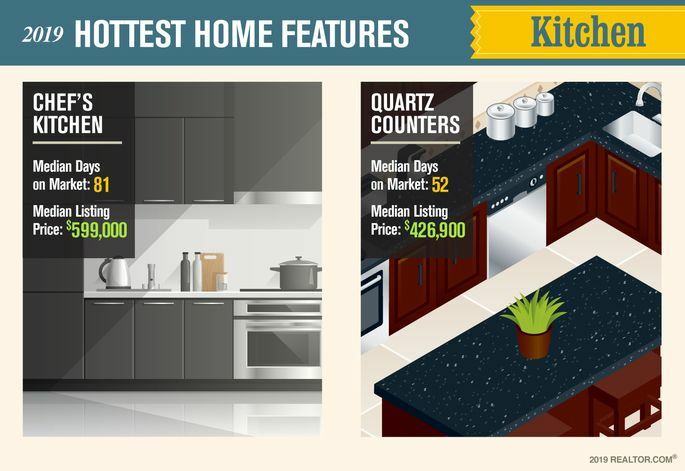 Homes with chef’s kitchens sell for a median $599,000—more than double the national median of $295,000. Chef’s kitchens generally feature an open layout big enough to accommodate plenty of cooks in the kitchen, a large island, a gas cook range built for larger, hotter flames, a Sub-Zero refrigerator and freezer, and multiple sinks and ovens. Popular brands include Viking ovens and ranges, Bosch appliances, and Kohler and Moen faucets and sinks. The average kitchen overhaul cost $12,300, while major kitchen overhauls usually cost upward of $40,000, according to the Harvard University study. “People look at a kitchen, and if they don’t like it—they’ll often pass on the house,” says Lori Wellman, owner of Lincoln Cabinet, a Lincoln, NE–based remodeler. Quartz counters (No. 6) are also in high demand. The engineered variety (a fancy word for enhanced) doesn’t chip as easily as the natural kind, doesn’t require much upkeep, and is difficult to stain or damage. Plus there are hundreds of colors, patterns, and textures to choose from. It was the material of choice for home renovators, rising from a 41% market share in 2017 to 48% in 2019, according to Houzz data. Specialty rooms: Why go out when you can stay in? Properties with dedicated specialty rooms, like theater rooms (No. 2) and home gyms (No. 3), showed up in only a small percentage of listings (1.5% and 1.1% respectively). And while they’re not as popular as they once were, say design experts, homes that come equipped with such rooms sell for about twice as much as the national median of $295,000. They’re fun to enjoy, too! Folks without big bank accounts can also create these spaces on a shoestring, DIY budget. Dark basements can become theater rooms, for example, with the addition of an oversize screen, wireless speakers, and a comfy couch. Popcorn makers are a bonus! Unlike theater rooms and gyms, mudrooms (No. 11) have been gaining in popularity in recent years, say design experts. These small rooms are where coats and dirty shoes are kept are typically located toward the front of homes, and more homeowners are retrofitting them into their abodes. They’re becoming more stylish with rustic, wood benches to store those muddy boots under and fancy coat racks. “Mudrooms are a fantastic transition from an outdoor space to your indoor living [space],” says organizer Novak. They cost an average $12,000 to install, according to Fixr, a company that connects owners to home-related services. Home offices (No. 9) have also become increasingly sought-after as more people work remotely or go freelance. The key is natural lighting, perhaps a window view for the desk, and doors that can shut out the clamor of the kids playing in other parts of the home. The trend today may be all about indoor-outdoor living. But it wasn’t beautifully inlaid patios, outdoor kitchens complete with pizza ovens, or trickling fountains that came out on top for outdoor features. That honor went to three-car garages (No. 4). “Americans love their garages,” says Rick Foster, a managing broker and license partner at Engel & Völkers Annapolis, in Maryland. Buyers aren’t just looking for a place to park their cars. “Having extra storage space is a big benefit,” adds Foster. Certainly prestige comes into play—for many, bigger is indeed better. But unlike some outdoor features, this one is difficult and costly to add after the fact. Buyers want one already in place. Other popular outdoor features on our list include solar panels (No. 5), tennis courts (No. 8), and in-ground pools (No. 10). Solar panels are hot (yes, really) thanks to demand from both climate-conscious buyers and those simply hoping to cut down on their electricity bills. 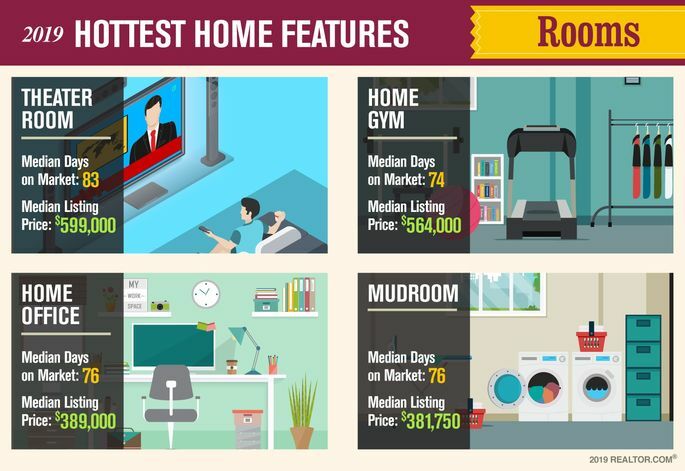 Homes with these features sell the fastest of all of the amenities on our list, at a median 51 days. About 2% of homeowners undergoing remodels have been installing them each year from 2015 to 2017, according to Houzz data. But be warned: They’re not cheap. Installing a 5-kilowatt system, the standard system of about 20 panels, costs around $25,000 to $35,000, according to www.solarpowerauthority.com. Tennis courts are also appealing, but they can set homeowners back more than $50,000, according to Quality Court Industries, a tennis court construction firm that operates throughout the Southeast. Even having a shared court open to residents of a community can boost property values. The same goes for in-ground pools, which can be private or shared as well. Built-in pools are polarizing features in some parts of the country—attracting some buyers while repelling others due to maintenance or liability issues. The cardinal rule for this feature: Install it for your own enjoyment first, resale value second. Smart home technology (No. 14) is a catchy umbrella term people use to describe everything from a few interconnected appliances or internet-controlled thermostats to fully wired homes. The expensive, built-in approach has waned a bit, but the more ad hoc approach is booming, thanks to smart devices that can be used as simple control centers, like Amazon Echo and Google Home. “The convenience is unparalleled, and the technology is getting so easy to use,” says organizer Novak. Security systems (no. 12), often smart ones integrated with mobile and other devices, are gaining traction as must-have features. Just 10% of homeowners undergoing remodels had a security system installed in 2015, according to Houzz data. By 2017, about 15% did. Folks used to have to hire a security company to come in, assess the property, and then install a system that could run anywhere from $600 to more than $1,000. And that doesn’t include the monthly monitoring fees. Now, homeowners can pick up a simple, smart home security system from companies like Ring for around $150. “People really like having an app on your phone and knowing if someone’s at your home and being able to speak to them,” says Craig Grant, CEO of the Real Estate Technology Institute, an online portal where folks can learn about real estate technology. Some things never go out of style. Fireplaces remain a highly sought-after amenity, although today’s sleek, electronic models don’t have much in common with the ashy traditional hearths. These newer fireplaces are often installed right into wall. “No matter where your home might be, fireplaces are always welcome,” says Nancy Fire, the design and trend forecasting expert behind the HGTV HOME brand. 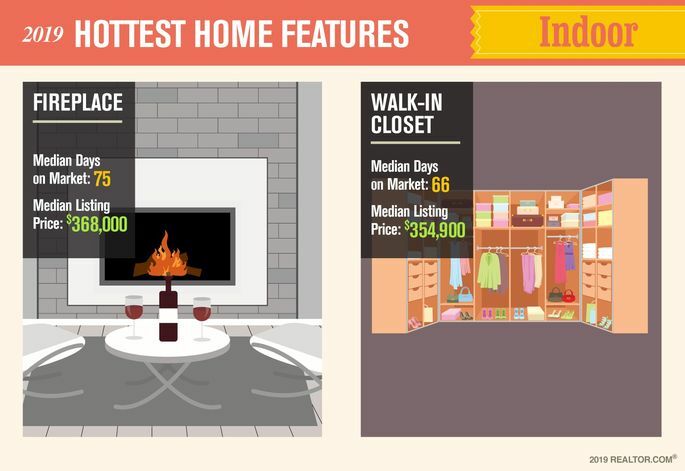 Other timeless features that boost home values are spacious, walk-in closets. Sometimes folks will even tear down an adjacent bedroom to build that massive closet with floor-to-ceiling shoe and accessory walls, a ladder to store and fetch rarely used items, and seating to make it easier for friends and family to share their outfit opinions, says remodeler Wellman. Walk-in closets, while still popular, aren’t as in-demand as they used to be—and the decluttering movement (and its guru Marie Kondo) can partly be blamed. Clare Trapasso and Rachel Stults contributed to this report. Lance Lambert is a data journalist for realtor.com.